Coffee enthusiasts from all over America descended on Knoxville the weekend of January 21-22. It was a weekend to remember as we talked with and watched some of the best coffee professionals in the nation compete in and judge the SCA Barista Competition, Brewers Cup, Roaster Competition, Cup Tasters Competition, Latte Art Competition. What do those different competitions entail you might ask? In 10 minutes, the baristas prepared and served 4 espressos, and 4 personally designed signature beverages for sensory judges; all while being assessed on their preparation abilities by two technical judges. Owner, John Clark, was a guest, non-scoring, judge of this competition. Read below to hear about his experience. Jon Lewis, with our friends at Deeper Roots Coffee, shares his "Liquid Sunshine" with the judges on stage. He was also gracious enough to leave some of this delicious Kenya AA from the Kiriani Farmers Cooperative Society with us to serve on our pour-over bar. "The United States Brewers Cup (USBrC) is an exciting competition that highlights and celebrates the art of manual brewing. Competitors will perform three services, Compulsory, Open Service, and Serve The Audience. Compulsory & Open Service are judged by skilled coffee tasters. The Compulsory is a blind tasting, the competitors all brew the same coffee on their chosen manual devices. During Open Service competitors will brew and present their chosen coffee to the judges panel." The Roaster's competition "is designed to highlight the art and craft of coffee roasting." The format for this championship is new this year. For the Preliminaries held here and in Austin TX, The Judging panel of Roaster's Guild member judges "blind" sampled and scored each competitor’s submissions of THEIR roasted versions of the SAME coffee from Kenya. The competitors presented a short presentation describing the flavor notes, how and why they roasted the coffee they way they did, and shared their green coffee knowledge. Attendees had a chance to sample each competitor's coffee after the judges partook. John was also one of the judges of this competition. Read below to hear about his experience. Cup Tasters Competition - "Different taste preferences are found in coffee cultures around the world, and the U.S. Cup Tasters Championship (USCTC) does not ask contestants to judge or evaluate coffee for these preferences. Instead, the competition challenges competitors to test their sensory skills by discerning taste differences in a “triangulation.” Tasters receive 8 sets of three cups, or triangles, where two cups are identical and one is different. The competitor with the ability to taste, smell, concentrate, and recall, those with the most correct answers in the shortest amount of time wins." Baristas competed at local shop, KBrew, showing off their latte art skills. They are judged on creativity, symmetry, and contrast of their expertly prepared lattes. Even a Guest Judge gets the Barista's full attention... and tastes it all! The Specialty Coffee industry is about finding, roasting and presenting the very best coffees IN THE WORLD. If you don't climb into the arena and compete, how do you know that you are among the best? I've observed and studied the competitions since 2001 when I first became aware of the wondrous world that was swirling around within the Specialty Coffee Association of America (SCAA). You can not believe how exciting a coffee competition can be until you see someone at the top of their game set the last cup in front of his judge with only 1 second left. This year, as a first step toward eventually encouraging all of our Barista's to compete, I signed up to sit behind the table and participate in the judging. My way, I figured, of tasting first hand how/if we measure up to the best in the world. I think we do! Our Baristi have now had 5 years of warm up. Next year perhaps one of Vienna Coffee's finest will climb into the arena and sling some drinks? Your esteemed judging panel! Real Pros, every one! Of course, we've been at this coffee roasting game far longer. We even have two Bronze Medals from the first two Compak "The Golden Bean" North American Roaster's Competitions proudly on display. As a Roasters Guild member for many years, I've cupped (tasted) the competition coffees and voted a number of times on the best at the SCAA. This year was different. As SCAA becomes simply the Specialty Coffee Association (SCA) via a merger with SCAE (Europe), new rules emerged and the real fun began. 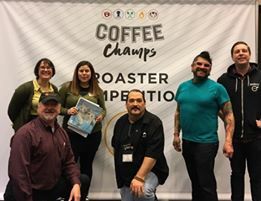 I was honored to join the judging panel for this first preliminary heat alongside Executive Council Members and other seasoned roasting professionals. Together we sipped, spit, sniffed and swirled 28 samples of a nice Kenya AA coffee. After the blind scoring, we got to hear these talented young roasters describe how and why they chose to roast this particular coffee, this particular way. Eventually, even the general public got to taste the competitors offerings. Nice, very nice! At the end of two highly caffeinated days, these 6 roasters were selected to advance to the US Championship in Seattle, WA April 21-23, 2017. You can check out all of the winners by going to their website.